A Pap smear is NOT a test for ovarian cancer; it detects cervical cancer. Women with a family or personal history of ovarian or breast cancer. Women who have never been pregnant or given birth. WHAT CAN REDUCE THE RISK OF OVARIAN CANCER? Ovarian cancer is one of the five leading causes of cancer death in America women. Ovarian cancer occurs in approximately 1 in 72 women. Each year, over 20,000 women are diagnosed and about 15,000 women die. A woman’s chance of survival is better if the cancer is found early. 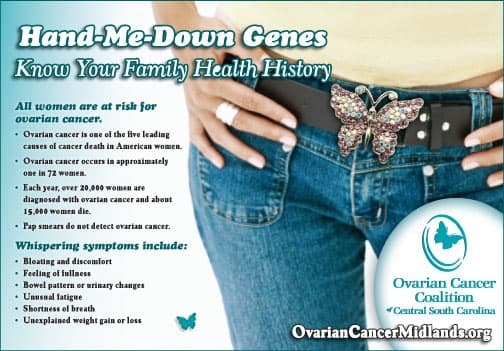 There is not a universally accepted test for ovarian cancer- that is why knowing your family history and recognizing symptoms are so important. KNOW YOUR FAMILY HEALTH HISTORY!